While I’m clocking up those miles I do often think about the good waters that I’m driving past and there are several that I wanted to pay a visit to at some stage. One such place was Etang 5 in northern France. I’d known about it for many years but somehow I’d just never got around to it. In recent years I’ve made a conscious effort to fish more of these waters though and so I bit the bullet and reserved a swim through Fisherman Holidays. Now I have to admit that I’m the world’s worst when it comes to doing homework in advance of a trip. Almost every day I get asked for advice on venues by other people, generally through social media and, almost without exception, I’m always pleased to help out. I actually feel honoured in a way, that people choose to come to me for advice! But for some reason I’ve got this block about asking others for information – in a way it helps me to learn more myself, rather than taking short cuts but, of course, acquiring as much info as possible should be better than going in blind. Rightly or wrongly I’d heard that swim 8 on Etang 5 was a good one, only when I went to book, swim 8 was already reserved and so I just opted for swim 1, which commands the same area of water but directly opposite from swim 8. I knew very little about the lake, or the fish, and absolutely nothing about swim 1 – but that would be our home for a week and we looked forward to it. The shorter drive was certainly one of the attractions and although we actually fished a water in southern Belgium the week before, it wasn’t too much of a diversion and the van must have wondered what was up when we were there just a couple of hours after firing up. In the rules it said to arrive between midday and 3pm on the Saturday. So we rolled up at around 12.30pm to see all the other swims already occupied, with bivvies up and everything! I thought I was keen to get on there but I was the last to arrive! But that’s the beauty of booking a swim in advance – no one’s going to be in your swim whatever time you arrive! If first impressions are anything to go by, then we had definitely made the right choice. The feeling of space and openness as we drove into the swim was overwhelming – not to mention the amount of water that comes with it. It just looked great with lush, grassy banks going right down to the crystal clear margins. No worries about setting up the Titan T3 and gazebo here – there was enough room for about twenty of each! In the warm afternoon sunshine I was in no rush to set up and took my time in between scanning the lake. A long way over to my left I could see a white post, which I was sure would be the boundary marker between swims 1 and 8, and it was as I was looking straight at the pole that I saw the unmistakable shape of a good mirror lunge half out of the water, before flopping back in. I sort of did a double-take on that and it was purely by chance that I was looking at the right place at the right time. I kept watching but saw no other signs, although that didn’t matter as I knew exactly where my first rod was going! I wasn’t going to go in too heavily on the bait front, it was still early enough in the year that I didn’t think that they would want heaps of bait. In fact, apart from the double 15mm Scopex Squid hookbait, most of the free bait would be made up of smaller particles – such as hemp, pellets, sweetcorn, maggots and flaked Scopex Squid boilies, with just a sprinkling of whole ones. I wanted as much attraction down there without necessarily having lots of food on offer. The row out to the spot took longer than I thought. I’ve actually got one of those phone apps that tells you various measurements including distances. It showed that from my swim to the point I was going to fish was over 320 meters, quite a distance for sure but it was within my water and it was where I’d seen the fish show – so it was where the bait had to go. On any water getting your bait to where the fish are is always half the battle and all I can do is make sure that I’ve got the right gear to enable me to do that. I kept the echo sounder on all the way across and it was obvious that the weed was covering most of the bottom. It was predominantly between 7ft and 9ft deep and the weed was probably coming up off the bottom about 18 inches. That wasn’t a problem, other than I was hoping for a clear spot to present the baits. But just as I was approaching the spot where I’d seen the fish show, the bottom suddenly just shelved down to 12ft and the weed stopped! I had a feel around with the lead and sure enough it was firm, clear and sandy – perfect! My other rods were spread in a line at around the same range as I’d seen nothing else and that would do until I had reason to try other spots. 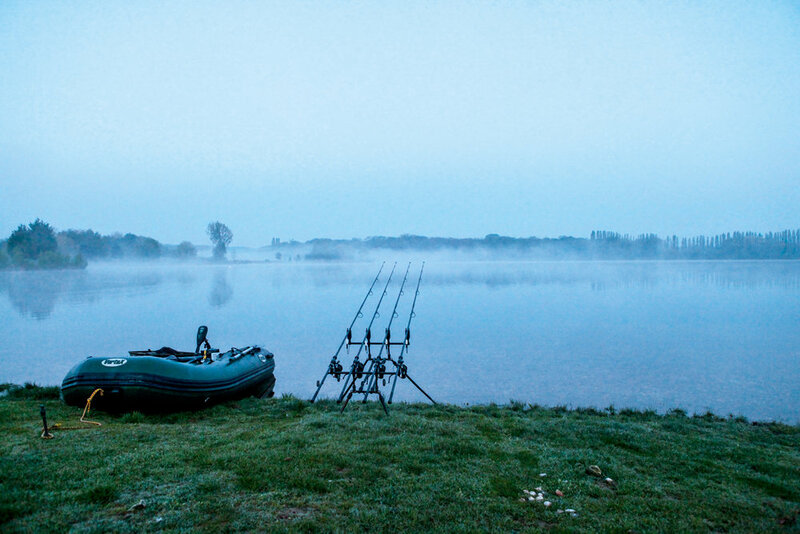 The beauty of having no one else set up nearby is that I can always relax and have a really good kip that first night, and that’s largely what I did – apart from one interruption from a huge slab of a bream that got the heart pumping before I realised what it was. Other than that it was all very pleasant. In the morning the bailiff, Patrick, arrived with his dog Jade and a bag of fresh croissants that we’d asked for when we arrived. Patrick and Jade were both stars, it has to be said, and starting the day with a pot of hot coffee and fresh croissants is one of the joys of life for me. One of the reasons for picking swim 1 was that it has a large shallow bay to the left, which is only fishable from that swim. I knew that the fish would target the shallower areas at that time and, indeed everywhere I’d been up to that point, it was the shallows that produced the best results. But as hard as I looked it just seemed barren there, maybe the lack of weed was the problem or maybe I was just a little too early. Either way fishing the bay was put on hold for a while and it was the main body of water that seemed to offer the best chance. It got to around midday and the sun was starting to feel quite warm. We were just thinking about a spot of lunch when a single bleep made me look up sharply. The left tip was pulling down slowly and as the line pinged from the clip, the R3 burst into life! At that distance it was hard to feel anything to begin with but, sure enough, a solid thump was all the reassurance I needed. At that range and over so much weed it was definitely a boat job, so the life jacket went on and I slowly made my way out following the tight line into the distance. When you are just taking up the slack like that, it’s almost impossible to know what’s going on at the other end and I just hoped to find a fish when I got there. The line was pointing more or less where I had dropped the bait, but as I got closer the line pinged up from a clump of weed. As I tightened up the line went ping, ping, ping, almost in a semi-circle as it came free of the weed and way down to my right there was an eruption on the surface as I made direct contact with one very angry carp! In the crystal clear water I was able to see the fish for the entire battle and it’s one of the things I love most about using a boat. I could see every scale and even how good my hook hold was as it got closer and, sure enough, it wasn’t long before it was lying in the bottom of the net – off the mark! It made a change to have so much water out in front of us! The first one from a new water is always a great feeling and how fortunate I had been to see that fish show on the spot. As they say, observation is always key. It was a lovely high-backed mirror of just over 35lb with clean white lips. If all the fish looked like that one then I wanted to catch more! Anyway, with the pics done, the rod was soon back out on the spot and the kettle went on for a celebratory cuppa! It didn’t seem like there were many fish in the area, or at least they weren’t showing much to start with. Watching the water wasn’t made any easier by ‘Sid the Swan’ who insisted on always standing right in front of me and demanding food. His wife Nancy was over on the point, guarding four eggs, and Sid’s job was to chase every other swan off and to try and eat us out of house and home. It actually started off as ‘Hissing Sid’ as he was doing plenty of that but soon turned in to ‘Sid Vicious’ as he seemed to want to eat my fingers along with any bit of bread I offered him – hence Sid and Nancy! Despite not being able to see much, the same rod was away again but this time during the hours of darkness. I just followed the same routine as with the first fish and, sure enough, I landed another great-looking mirror of 25½lb – no monster for that lake but that didn’t bother me one bit, it was just nice to get another one. I didn’t see much for a while but this one sneaked back down for a feed! Over the next couple of days it became warmer but, instead of the fish arriving in the bay as planned, they headed up the lake to a plateau out in the middle. Unfortunately, it was way out of my water so I had no choice other than to just sit there and watch them showing constantly, while my areas looked devoid of life. Joan says that one of the things I’ve got better at over the years is being more patient. I guess she’s right, years ago it would’ve driven me mad to be in that situation, but my view nowadays is that there’s very little I can do about it other than wait and just hope that they will return. Maybe they would, maybe they wouldn’t? Time would tell and at least I already knew that I hadn’t blanked. I did fear the worst though, as they seemed to be quite happy where they were and the guys in the swims up to my right started to get amongst a few. When the sun and the flowers come out, you just know the fish will be heading for the shallows! It needed something to change and that came when a couple of guys on the other side, who had been struggling, decided to get themselves right on top of the fish. But instead of doing it discreetly, they sat out above the fish for around two hours, prodding the bottom and moving markers around. I did wonder if it would affect the fish and, sure enough, over the next hour or two I saw fish starting to move back towards my end of the lake. More and more fish began to show close to the baits and surely one had to go sooner or later? Then the bleep came and the rod tip started to pull down. It wasn’t the same rod as before but the next one along – but that didn’t matter, I was on it like a shot! It was a lovely big chunk of a mirror and the best of the week! I had the fish moving for a bit before it ground to a halt in the weed and so the boat was called into action once again. For me it’s the worst time, trying to get out there as fast as possible and not feeling in control until I’m right above the fish. It’s almost like one of those horror films where someone’s running down a corridor but the door at the end is getting further away. Perhaps that’s a bit dramatic but you know what I mean. Gradually, the angle of the line sharpened until it was pointing directly downwards and then I saw a big cloud of mud and out from the murky water appeared the shape of a large carp! In the clear water it was an amazing sight and at last I was in direct contact – let battle commence! What a battle it was too. This fish had so much more power than the others and I was pulled around for ages in the boat. Several times the fish tried to bury itself in the weed but everything held up and I let out a big sigh as the fish slid over the net cord. This was an absolute cracker, in just as good nick as the others – only a lot bigger! Sure enough the scales creaked around to 55lb 4oz and I was one very happy chappy! I really thought that was going to signal the start of a great period, but instead the fish seemed determined to sneak back to their plateau further up the lake and with the boat activity now calming down that’s exactly what they did. Time was, of course, starting to run out as it always does, and going into the evening all seemed quiet once again. But the next morning things definitely started to change. For the first time I saw a fish show much closer and soon after that another one – not far from the entrance to the bay. I had to go out and have look from the boat with the polaroids on. As I was making my way across to the bay I suddenly came across a big cloudy area and almost straight away the dark shape of a carp appeared out of the gloom. I did nothing more than shoot straight back to the bank to grab a rod. Joan’s rods had been fishing closer in and more to the right and so I asked if she wanted one of hers moved over to there – which of course she did! So I slowly made my way back to the area with her rod and sure enough there were still plumes of mud being stirred up. I dropped the bait in place as carefully as possible and just hoped that I hadn’t spooked the fish as it was quite shallow. A few hours passed and, although we had been expecting that rod to go off, it hadn’t and I just couldn’t resist another look out there. Sure enough the water had cleared right up and I could see the rig lying on the bottom. I’d either spooked them or they’d just moved on. I carried on scanning the bay and right at the back there was clear evidence of fish in the area and all I could do was to try again. This time the water was so murky that I literally couldn’t see anything, so I just dropped the hookbait down gently, with half a dozen Scopex Squids around it. Back at the bank Joan was just clipping the indicator on when I saw the rod tip slowly bending around. For a couple of seconds we both looked on in disbelief but, sure enough, this time the trap had worked within minutes! Joan picked up the rod and the line started to cut through the water. There was only sparse weed in the bay so the boat wouldn’t be needed and she started to slowly retrieve whatever was on the other end. I don’t know why but I was expecting to see a small common when it surfaced, so I was pleasantly surprised when a decent mirror came in to view. Joan did a great job and I waded out as far as I could with the net and it was soon job done. It was a lovely dark mirror with apple slice scales on the shoulder, and a good size too at 40½lb. It was to be the last fish of the trip and what a nice way to finish!